If you’re a digital artist working in illustration, graphic design, animation, or any other non-traditional art form, you probably already know how useful a drawing tablet can be for bringing your creations to life. Wacom’s Cintiq tablets are hugely popular with digital artists, but they’re not the only option. If your budget doesn’t quite stretch to Wacom’s high prices or you simply want to try out an alternative brand, here are the ten best alternative drawing tablets. Screen – Every option on our list has a screen because it can be an extremely useful feature for artists. Consider resolution, color accuracy, and size when choosing the right screen for you. Stylus – the more pressure levels, the more accuracy you’ll have when sketching and shading. A tilt-able pen will provide a more natural work angle and better control, and a battery-free version with on-pen controls will help increase your productivity. Connectivity – Wireless connectivity keeps your desk tidier and can be more convenient, but you might get a more reliable connection wired in. Some of the options on our list are standalone tablets, so you don’t actually need a laptop or desktop to be able to work with them. There isn’t another specialist drawing tablet on the market that stands up to the 27 QHD, but Microsoft’s Surface Studio 2 is 28 inches of creative muscle. Computing power is at the heart of this tablet, and lightning-fast graphics, a minimum of 16 GB RAM and an Intel Core i7-7820HQ processor will delight artists working with demanding 3D software. Rendering is smooth and efficient and there’s no lag with video, ensuring that your workflow isn’t interrupted. A minimum of 1TB of SSD storage is a huge bonus for a standalone tablet like this one, and will make light work of the biggest files. The PixelSense display is spectacular and 13.5 million pixels deliver color accuracy that stands up to even the most demanding color-critical projects. 10 point multi-touch gives great control of the screen and there’s no noticeable lag as you write, draw, and gesture. Regarding downsides: the pen won’t offer anywhere near as much control as Wacom’s tilt-able version, so painters and drawers may find this option lacking. But other than that (and the astronomical price) the Surface Studio 2 is spectacular. Apple’s iPad Pro is our recommendation for a portable drawing powerhouse like Wacom’s MobileStudio Pro 16. It comes in an 11” model but we’re reviewing the 12.9” for this article. Apple’s A12X Bionic is the most powerful chip the company has ever created, and it’s capable of running five trillion operations per second. That’s more powerful than most PC laptops, so no matter how complex your projects are you’ll enjoy rapid, lag-free performance. The new Liquid Retina display combines with ProMotion technology to deliver a gorgeous and super responsive experience all the way to the edges. Colors are true to life, tones are natural, and the level of detail gives you the perfect device to create intricate artwork on. Apple’s new pencil is touch responsive, so you can double tap to change functions without interrupting your workflow. It’s easy to charge, too, and magnetically attaches to the iPad to re-juice automatically. The glass screen doesn’t feel great to draw on, so you’ll likely need a matte screen protector, but that’s a minor niggle considering how much this tablet offers. Huion’s KAMVAS GT-221 Pro is a superb alternative to Cintiq 22HD. And what’s more: it’s half the price. The first way in which Huion’s offering beats Wacom’s is that it boasts almost four times as many pen pressure levels as the 22HD. If you sketch, draw, or paint you’ll really notice the difference in the level of shading control you can achieve in your creations. The Full HD IPS panel is anti-glare and offers a 178° wide viewing angle which is ideal for collaborative projects. 16.7 million colors combine with 72% coverage of the NTSC color gamut for accurate and vibrant reproduction. It’s worth noting though that calibration with an external monitor can be difficult, so bear this in mind if your projects tend to be color critical. Ten press keys and a touch bar on each side of the tablet allow for left or right handed control, and you to customize your commands to suit the program and project that you’re working on. This level of control will enhance your productivity and make multitasking easier than ever. 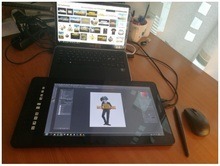 For an even cheaper alternative to the Cintiq 22HD, XP-Pen’s Artist22E Pro has got you covered. The extra-wide angle anti-glare display provides up to 82% Adobe Color Gamut accuracy, and the tablet’s driver now supports 4K displays so you can enjoy even more detail. XP-PEN’s latest stylus technology delivers an astounding level of pressure sensitivity which gives you excellent control and fluidity. It’s fully rechargeable, and when the batteries are full you should get two months out of them. 16 customizable shortcut keys distributed on the left and right of the screen can be configured to various third-party design software so you can set them up to suit your personal workflow. The price of this tablet makes it extremely appealing when compared with the 22HD, but the display lacks the sharpness that you get with Wacom’s version. This can make a noticeable difference in viewing fine detail in your drawings and paintings. For a mid-priced tablet, Huion’s KAMVAS GT-191 is a solid all-round alternative to Wacom’s Cintiq range. The 19.5” LCD wide-angle screen is a nice size for creating detailed artwork without it overwhelming smaller work spaces. The color range and gamut coverage match that of the GT-221 Pro, and the surface has a great paper-like feel to it which mimics traditional art materials. This tablet comes with two pens which are both designed to deliver a range of pressure levels that provide the control needed for detailed shading. They’re ergonomically designed and feel comfortable to use, and they last weeks on every charge to keep you working for longer. The pens also come with lots of extra nibs, but they’re so hard-wearing that you might not even need them depending on your level of usage. The included stand is robust yet lightweight, and is of a higher quality than some competitors are charging extra for. Some users might dislike the lack of hotkeys onboard this tablet, but with the addition of external control devices, we couldn’t love this great all-rounder any more. XP-Pen’s Artist16 is a strong alternative to the Cintiq Pro 16 and actually triumphs over it on some aspects. This drawing tablet’s screen doesn’t offer the UHD resolution that Wacom’s alternative does, but it supports 4K displays so you can still see your work in the sharpest detail if you have a good external monitor. The wide angle is also very appealing and gives you the perfect view from pretty much any position. It pretty much matches the Pro 16 in terms of color gamut though, supporting 92% Adobe RGB to deliver outstanding color accuracy. The pen falls short regarding pressure levels, but the pen/eraser toggle is a nice addition that helps keep your workflow nice and fluid. The built-in, adjustable stand does a great job of keeping the drawing tablet in position and doesn’t slide no matter the angle you use it at. The stand can also be removed and replaced with a mount if you prefer. If you’re fairly new to drawing tablets, you’ll love the included software to map the hotkeys and to set up calibration. Our only real complaint with this tablet is that the textured surface wears nibs down quickly, but we like the control and the paper-like effect enough to warrant the extra outlay on spare nibs. The Pro 16’s smaller 13” sibling has some real competition from Gaomon’s PD1560. The pen matches up to Wacom’s offering and has the kind of sensitivity that’s perfect for painters. And, with an accuracy of 0.5 mm in the center of the screen this tablet is also great for creating graphic work that needs accurate lines. The slim body of this tablet makes it perfectly portable, and the 3-in-1 cable is also small-space friendly and solves the annoyance of having cables making a mess of your workspace. In terms of productivity, ten express keys can be customized to suit your workflow, and the stand is easy to adjust to your perfect position to keep you comfortable throughout long work sessions. This tablet has the same drawback as Huion’s KAMVAS GT-221 Pro, in that it can be difficult to calibrate colors with external monitors. Colors look pretty accurate straight out of the box though, so unless your work demands absolute color accuracy you probably won’t even notice this issue. If your heart is set on the Pro 16 but you don’t have the budget, UGEE’s HK1560 tops our list of cheap alternatives. The Full HD 15.6” screen is vibrant and bright and is great for anyone who works in color, and although you’ll have to be wired in to use it, the tablet is compact which makes it nice and portable. The two included rechargeable pens come with eight spare nibs and deliver 2,048 levels of pressure sensitivity, which is pretty decent for a cheap Wacom alternative. The adjustable stand is also impressive, and the solid grip at its base keeps the tablet steady at any angle. UGEE’s drawing tablet also offers broader compatibility, which is appealing if you’re running an older OS that none of the other options on our list will sync up with. Wacom’s Pro 16 definitely offers advanced features and functionality when compared to this option from UGEE, and the lack of express keys is pretty frustrating. 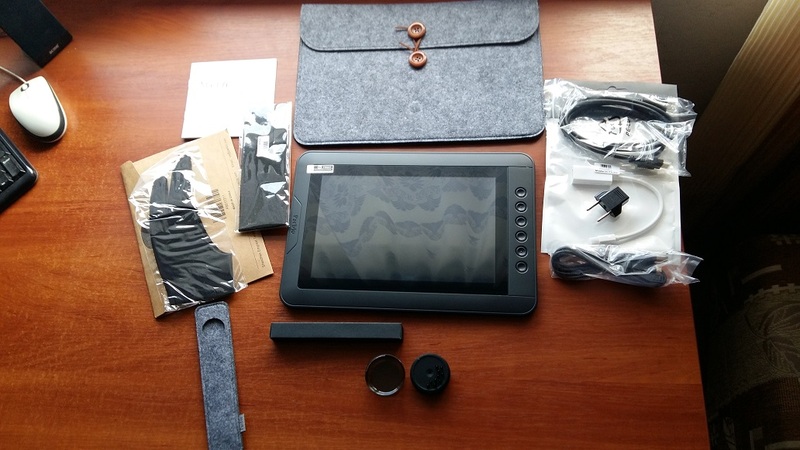 But, for the price, we were pleasantly surprised with how much this budget drawing tablet actually had to offer. It's really fun to draw on a screen directly even if it's only on a 10 inch graphic monitor. With this particular model I had Chinese installation instructions but if you have installed anything on a computer before then you'll find that it's fairly easy to install. The graphic monitor software itself was English. I had driver problems initially because I had not uninstalled my Wacom drivers. The device will work with Wacom drivers but you will encounter pressure sensitivity problems without the Parblo drivers. Having said that, once it was up and running it was really fun to use. Me and my artist friend (the digital artist in the video) loved using it. As I said before it's a 10 inch graphic monitor in order to do fine details you need to zoom into your work. With a bigger screen and a bigger resolution, you would still need to occasionally zoom in but less often. You may check out our review for further details. If you have simpler needs like basic photo retouching or simple comic animation then you might want to consider an entry level 10" or bigger tablet. If you’re a beginner taking your first steps into digital art, Simbans’ PicassoTab is a superb alternative to Wacom’s Intuos Draw tablet. The widescreen 1,280 x 800 display on this compact tablet is crisp enough for hobbyists to draw, paint, and design, and the IPS panel gives a great wide viewing angle which makes it good for sharing ideas and collaborating on work. Beginners might not want to invest in expensive software, so the inclusion of Autodesk sketchbook is a handy addition. This pre-installed program does an equally good job of taking notes as it does drawing, which art students are sure to appreciate. If you’re looking to save work on your tablet, the 32 GB of storage is another useful feature. Connectivity includes Wi-Fi, Bluetooth and GPS making this tablet a great all-rounder, and there are a few added extras which makes it even better value for money, including a pre-applied screen protector and a tablet case. The small display area and less-than-spectacular screen might frustrate pro artists, but if you’re a serious artist you probably won’t be looking at a tablet of this size anyway. Huion’s KAMVAS GT-191 is an excellent all-rounder, and at less than $500 it will save you some serious money when compared to Wacom’s range. The screen is bright, sharp, and color-accurate, and the pens are some of the best on the market. The lack of hotkeys did annoy us, but even if you purchase an external control dial or keyboard you’ll still spend less than you would on a Cintiq. If you want to spend even less, Parblo Mast also packs in a surprising amount of pro-level features for a shockingly low price. But, if it’s computing power you need, Apple’s iPad Pro or Microsoft’s Surface Studio 2 both offer efficiency beyond your wildest dreams. In the the 10" graphic monitor bracket there are no Cintiqs. Although numerous companies make small 10" graphic monitors (not tablets). Such as the Parblo Mast10, which we reviewed. I would not consider any of them a reasonable alternative to Cintiqs or for drawing in general. I would suggest you rather spend the equivalent money on a regular affordable college tablet with a stylus. What did I conclude from looking at all these monitors/companies? All of these have IPS displays and most of them have full HD resolution 1080*. All of them are relatively cheap in comparison to a Cintiq 13HD. Except Dell and Microsoft, of course. All of them have driver problems. So you really need to be aware of that. Mac seems to cause more problems than PC. What are we comparing these alternatives to? Important note: The Cintiq Pro 13 is roughly as expensive as the Cintiq 13HD Touch. Which makes the new Cintiq Pro 13 the default choice if you have the money for it. The Cintiq 13HD is the cheaper choice if you don't care about touch functionality. One way to differentiate between these monitors is looking at their stylus technology. This is an excerpt from our stylus guide. EMR stands for electromagnetic resonance . It is the oldest and the most reliable. Used most commonly in the Intuos line of graphic tablets by Wacom. This is why Wacom is the industry leader in drawing tablets because they got the hold on the patented technology that allows for a stylus to influence a graphic tablet without a power source of its own. Recently they have been partnering up with companies such as Samsung or Apple who have adopted their technology. N-trig is a small Israeli company that Microsoft acquired in 2015. The Stylus you nowadays see accompanied with the Surface Pro is from that company. The digital pen runs on a powered stylus with a passive digitizer. Wacom AES which stands for Active Electrostatic Solution is Wacom's response to being poked by a competitor like N-Trig. Powered stylus with a passive digitizer. The new Wacom Pen 2 features 8192 levels of pressure sensitivity and 60 degrees of tilt sensitivity (which currently is a feature only Wacom has currently). There are no physical shortcut buttons and are instead replaced by the Wacom ExpressKey which is extremely handy and sold separately. Such as the Apple stylus. Made by the company that owns Artisol. Used by companies like Yiyinova and Huion. Wacom pens do not require batteries, just like the pens from Artisul, Bosto, Parblo and the one from Dell Canvas.